Clinical Applications of Human Neuroscience: A Laboratory Guide is a succinct and clinically relevant guide for learning how to interpret and understand findings elicited on clinical examination. The guide offers a review of essential information on neurological examinations, perfectly blended with a structured set of clinically relevant exercises demonstrating the use and application of basic neuroanatomical and neurophysiological information in the performance and interpretation of exam results. Dr. Michael F. Nolan organized Clinical Applications of Human Neuroscience around the basic elements of the neurological examination - sensory systems, motor systems, reflexes, and cranial nerves - with information that is useful in both performing the exam and interpreting the elicited findings. The exercises inside are designed as group activities, offering the opportunity for students to discern that most findings in clinical examinations are characterized by a range of responses in both normal individuals and persons with neurological abnormalities. Inside Clinical Applications of Human Neuroscience, each chapter includes a series of neuroscience review questions that focus on the anatomical and physiological principles necessary to interpret exam findings. Also included are application exercises, modeled on the neurological examination, that directly link the basic principles with their clinical application. 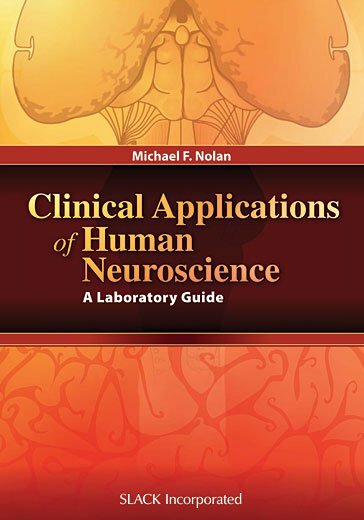 Clinical Applications of Human Neuroscience: A Laboratory Guide is a one-of-a-kind reference perfect for physical therapist students, clinicians, medical students, and other health care professionals involved in the evaluation and treatment of individuals with neurological disorders. Dr. Nolan is currently Professor and Vice Chair of the Department of Basic Sciences at the Virginia Tech Carilion School of Medicine and Research Institute in Roanoke, Virginia. He is also Professor Emeritus of Pathology and Cell Biology in the Morsani School of Medicine at the University of South Florida in Tampa, where he received numerous awards for teaching at both the undergraduate and graduate medical education levels, including the John M. Thompson, MD Outstanding Teacher Award in Neurosurgery. He is the author of Clinical Applications of Human Anatomy: A Laboratory Guide and Cram Session in Functional Neuroanatomy: A Handbook for Students & Clinicians, both published by SLACK Incorporated, and Introduction to the Neurologic Examination.